Whether in a temperate, tropical, arctic, or subarctic region, you might find yourself alone in a remote area with little or no personal gear. 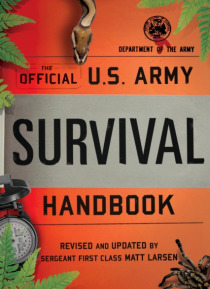 This thoroughly revised new edition of the classic U.S. Army Survival Handbook provides the information you need to survive. Widely recognized as the finest single source on the subject, it is standard issue for U.S. Special Operations Forces and pilots, an… d has been used by foreign militaries the world over. An essential resource for all outdoorspeopleincluding campers, hunters, hikers, and anglersthe U.S. Army Survival Handbook is a comprehensive volume replete with hundreds of full-color, easy-to-follow, user-friendly illustrations.